The rain in Spain falls mainly on the plaaaain……and in Barcelona as well… We arrived at Barcelona's quaintly named 'El Prat' Airport at 1:30 pm on Sunday , and the weather, while a little cloudy, was still quite sunny. A short cab ride to the city centre, and our small hotel, ' Circa 1905', (http://www.circa1905.com/eng/home ) in the Eixample district. By the time we'd unpacked, had a shower, changed etc, the rain had started to fall. 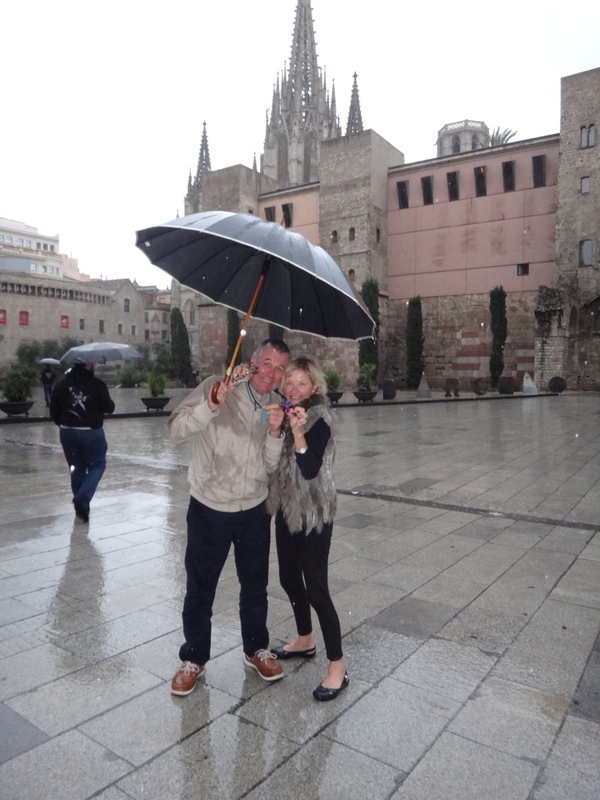 We grabbed an umbrella from the hotel lobby, and set out exploring the city on foot, for both of us the first time in Barcelona. As luck would have it ( or maybe not!) 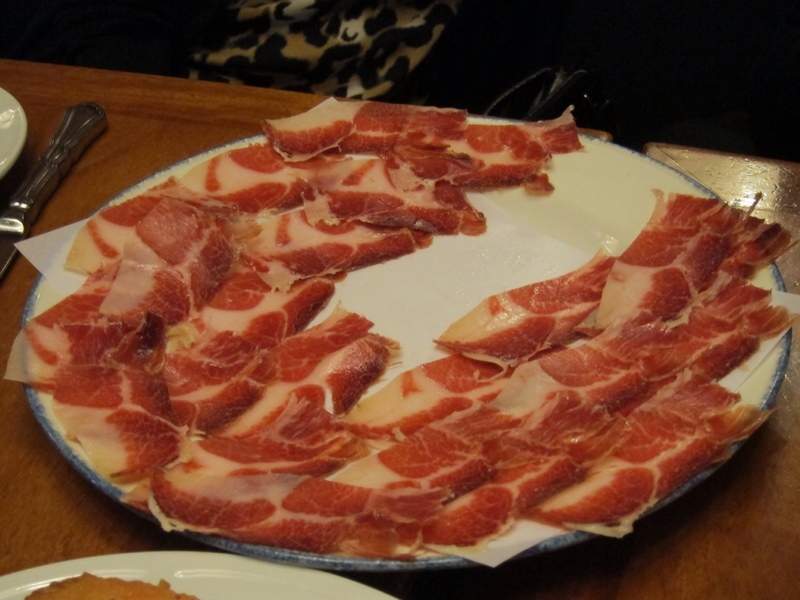 my best mate BL was in town, and we had ( he had) arranged to meet at the Cafe Vienna in Plaza Catalonia …. problem was, there was no Cafe Vienna in the plaza…Ym and I waited for the rain to ease a bit, and then headed off to a small square a few streets behind Ramblas, named Pi, where again we took shelter, this time in a Tapas bar. 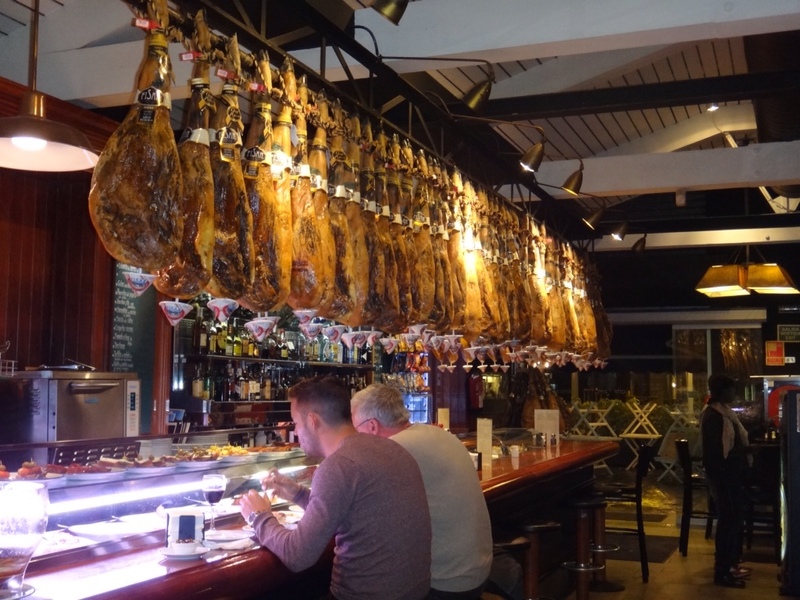 A bottle of Rioja later, and some few tapas, we ceased worrying about the rain…. and after a series of SMS messages back and forth between BL and I, not long after he joined us. What a reunion we had….. and we couldn't leave the tapas bar because of the rain, but after yet another bottle of Rioja, who the hell cared… and so we headed off, to try and find the way back to our hotel….but not before I had to use the rest rooms which were down a steep flight of narrow stairs in the basement…. there was a door marked Hommes, a door marked Femmes and most surprisingly a door with a logo of a wheelchair with the word ' Disabled' marked on it.. How any disabled person could possibly make it down the stairs in the first place to use this, or any toilet, had me baffled. Was it a law that you had to supply a disabled toilet…even if there wasn't any access to it? 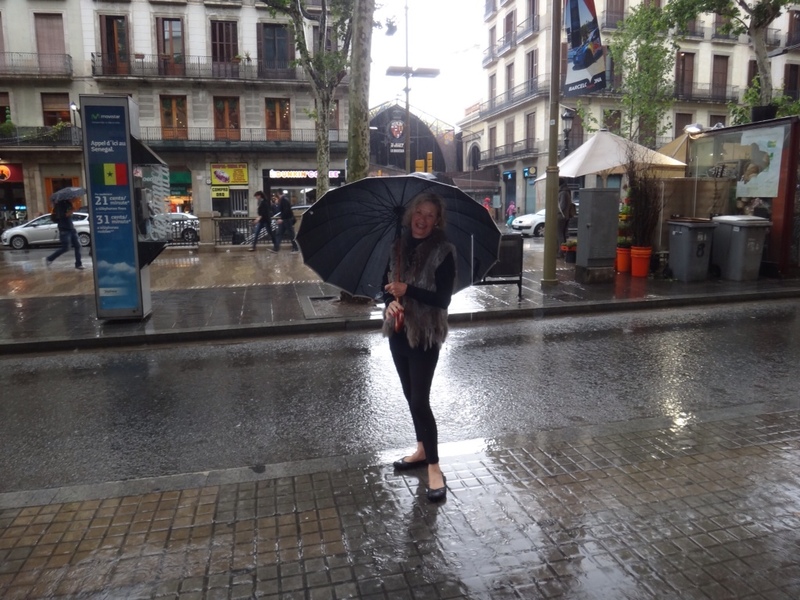 Now by this time the rain was really pelting down…I took a short-cut which wasn't, and we found ourselves lost in the Barri Gotic…. turned a few corners, up a few more narrow streets and suddenly we were in Cathedral Square…quite a way off track from the direction of hotel. We were wet, bedraggled but happy!!! Beunos Noches and lets hope that mañana brings better weather.